In their striving for novel ways to present on a rectangular sheet of paper a close-up view of an actor's head and shoulders, the so-called bust portrait (ôkubi-e), ukiyo-e print designers came up with several clever compositional devices that seem imaginative even today. Showing the celebrity reflected in his own make-up mirror was one approach. It afforded the viewer the frisson that comes with possessing an all-access pass to the green room, while at the same time opening up for the artist a catalog of elegant framing treatments. Another technique was to showcase the celebrity’s bust within the outline of a stiff fan, or uchiwa. The idea here was that, in the summer season, the more fanatical Kabuki fans could be cool and fan themselves with the cut and pasted uchiwa-e ... or at least fantasize doing it. Perhaps the most arresting of all seasonal outline portraits are those shaped like the distinctive Japanese battledore. Battledores (hagoita) go back in Japan at least 600 years, when the imperial court played a form of badminton called hanetsuki. Hanetsuki is rarely encountered today, but throughout the Edo period and after, women played the game (in fancy kimono!) as one of the ritual activities to celebrate the New Year. At some point, the battledore (but not so much the shuttlecock) found adoption as a resonant symbol of that very special season for Japanese, and households began to include an elaborately-decorated, not-for-use presentation paddle as part of their holiday display. Such fancy rackets can still be seen these days — often over-sized and tricked out with gorgeous oshi-e (raised silk applique) on one side and auspicious hand-painted symbols on the other. Some of the original buyers of this hagoita-e may have been tempted to cut along the black outline and paste Sankô to a display battledore. 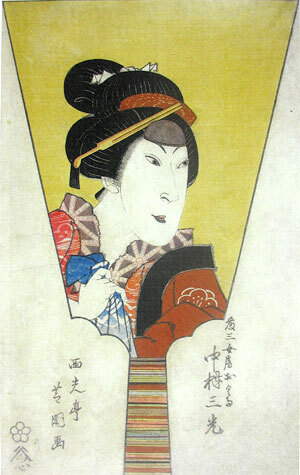 They would feel safe in the knowledge that the face of their idol would never be besmirched by impact with a shuttlecock, and the colorful ukiyo-e could replace the oshi-e which, in that period, would most probably have depicted a Kabuki image (or a beauty) anyway. On the other hand, possibly because paper glued to wood and left lying around a Japanese house nearly two centuries ago tends not to have made it through to our time, there is little indication that many actually did this. More likely, Sankô supporters were content to leave the sheet intact, deriving sufficient pleasure from its stylish evocation of New Year's. In any event, a goodly number of unadulterated hagoita-e have survived, mostly from a mini-boom period for such designs — in Edo as well as Osaka — datable to the first half of the 1820s. Sadly, the same survival record does not apply to Fig 2, an odd-format (26 x 16 cm) pair of deluxe Osaka prints by Sadahiro II (act. 1864-76), from a Kado Theater performance of 10/1873. 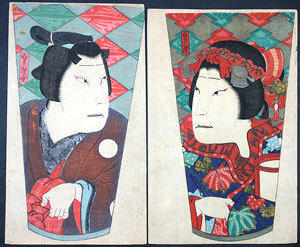 Both portraits are of Ichikawa Udanji I (act. 1862-1916), in the classic quick-change roles of Osome and Hisamatsu from the double suicide drama Osome Hisamatsu ukina no yomiuri. My scholar friends assure me these items, too, represent battledore prints, presumably one for each side of a modest-sized display model. (No other possibilities come to mind, though the narrow shape and curved bottom are a bit of a mystery.) As for their rarity? Well, apparently post-Restoration consumers felt a great deal freer about reaching for the scissors and paste, a cultural shift that has left Meiji print lovers today — forgive me, I can’t help it — up Collector’s Creek without a paddle. This article originally appeared in Daruma, no. 61, Winter 2009. Copyrighted © text and pictures reprinted with permission.